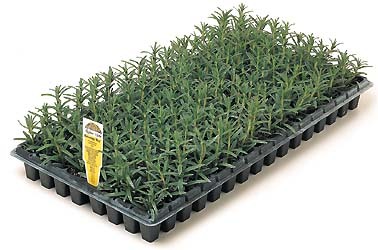 Richters plug trays make it easy to grow saleable potted plants in as little as 30 days. All the most popular varieties, including those that cannot be grown from seeds, are here. Plug trays are the perfect solution for landscapers and large home garden projects. And they're great for fundraising projects for your club or organization. Grown in 96 cell trays, but counted as 90 plugs. Are there other varieties you would like to see in plugs? Send us a note. Please note: Please allow at least 8 weeks for delivery.